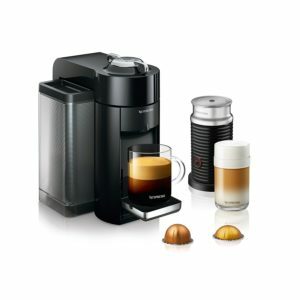 Nespresso started production of VertuoLine coffee machines in order to offer their consumers a unique taste of every cup. Since these coffee makers can use only VertuoLine capsules, they gave their best to provide a wide range of different flavors. VertuoLine coffee makers can brew coffee and espresso, and with the optional milk frother, you can make lattes, and cappuccinos as well. The Vertuo Evoluo and Evoluo Deluxe are the second generation of Nespresso VertuoLine machines, and it is natural that these two can offer more than the first models. They were made as an improvement of the first generation, so their basic upgrades are bigger capacity and higher temperature. But, you are probably wondering what is the difference between Evoluo and Evoluo Deluxe? That is why we are here. We will try to give you a detailed review of these two coffee makers in order to help you to choose the best one according to your needs. We will start with Vertuo Evoluo and its basic characteristics by explaining each one of them separately. It will be easy for you to track main differences in this way. Appearance: Vertuo Evoluo coffee makers are made of plastic in four different colors, black, red, silver and graphite metal. Its modern look will easily fit every kitchen style. Dimensions: with the dimensions of 7.9 x 12.2 x 12.3 inches, we can say that it won’t take too much space on your kitchen counter. If you take in account what it offers to you as a coffee lover, you will gladly sacrifice kitchen space for this coffee maker. Brew method: Vertuo Evoluo uses a centrifusion as a brew method. It means that the capsule is rotating 7000 times in a minute which guarantees a full extraction of flavors and a full taste every single time. Brew options: VertuoLine capsules are produced in two versions, big ones are for coffee and the small ones are for espresso. There are 14 different flavors to suit everyone’s taste. Extraction system: VertuoLine coffee makers have a laser bar-code reader that recognizes all bar-codes and it adjusts an amount of water and temperature to every beverage. Cup sizes: there is a choice between coffee ( 8 oz ) and the espresso ( 1.35 oz). You can’t adjust the water amount by yourself since the coffee maker is programmed to use an adequate amount of water according to a capsules bar-code. 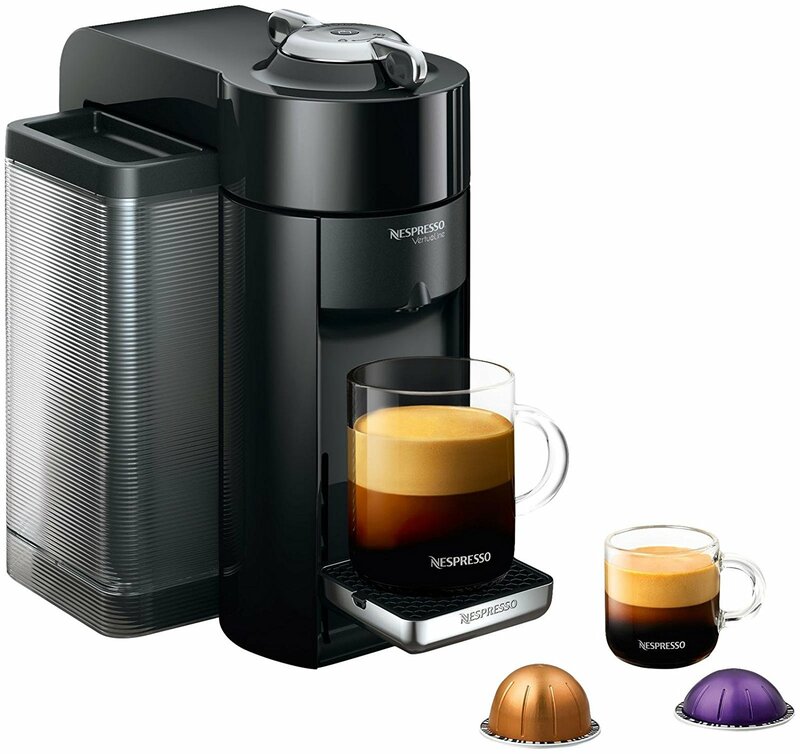 VertuoLine capsules: Evoluo coffee maker can use only this type of Nespresso capsules. They guarantee unique taste in every portion. All the aromas are hermetically sealed in aluminum capsules. You can choose between 10 coffee variations and 4 variations for espresso. 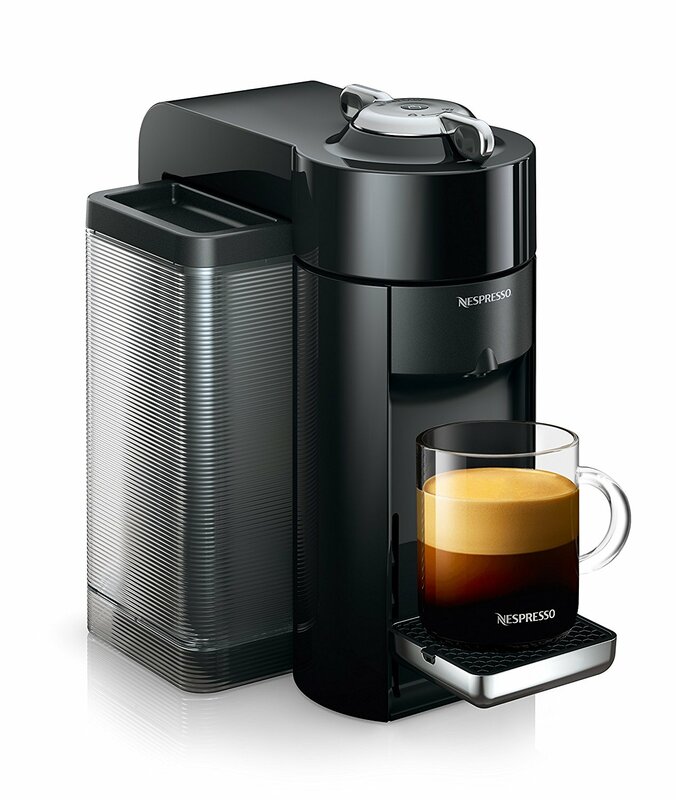 Brew time: it takes only 15 to 20 seconds for this little coffee master to heat up and prepare coffee or espresso. With just one touch you can get a fantastic cup of a morning pleasure. Water reservoir: Evoluo has a water reservoir with a 40 oz capacity which is more than enough to prepare coffee for the whole family. The reservoir is removable so the refilling won’t be a problem. Capsules container: the container for used capsules can accommodate 13 capsules. Cup holder: cup holder can be adjusted in three different positions in order to fit your cup size. Power Save Mode: this option turns off the machine 9 minutes after brew cycle in over. We have to say at the beginning that this model has been discontinued, but you can still bay it. This Evoluo Deluxe model is very similar to a Vertuo Evoluo model, but there are a few difference that can affect your decision which one to buy. That is why we did the review of this model in the same order as the previous one. This way it will be easy to see all the differences. Appearance: Evoluo Deluxe looks the same as the Vertuo Evoluo. It is made of plastic in four different colors, red, black, graphite metal and gray. Dimensions: dimensions of this Evoluo Deluxe model are 9 x 12.2 x 12.3 inches, and it is a little wider that Evoluo. We will later explain why is that. Even with this dimensions, it still won’t take too much space in your kitchen. Brew method: it uses the same method as the Vertuo Evoluo, the so-called centrifusion. The capsule is rotating 7000 times in a minute extracting the finest coffee you will ever taste. Brew options: just like Evoluo, it can only use VrtuoLine capsules for coffee and for espresso. You can also choose between 14 flavors. Extraction system: every VertuoLine capsule has a bar-code on its rim, and when laser reads that code it knows which temperature is ideal for preparing that kind of coffee. This way you will have a perfect beverage every time you wish for it. Cup sizes: it has two cup sizes, 8 oz per coffee and 1.35 oz per espresso. You can’t change the amount of water since it is determined by bar-code on every capsule. VertuoLine capsules: VertuoLine capsules preserve 14 different flavors in hermetically sealed capsules, all that in order to give you the unique taste of a freshly brewed coffee. Brew time: it takes 15 – 20 seconds to prepare coffee or espresso. Water reservoir: the water reservoir of an Evoluo Deluxe is 54 oz capacity and it is bigger than the Vertuo Evoluo’s water reservoir. Capsules container: the capacity of a used capsules container is 17 capsules. It can receive a few more capsules than the Evoluo. Cup holder: cup holder has three different positions in order to fit with the cups in different sizes. Power Save Mode: Evoluo Deluxe turns off automatically after 9 minutes in the state of inactivity. The only difference is in the capacity of the water container and used capsules container. This is why the Evoluo Deluxe is a little wider than the Vertuo Evoluo. If your family drinks a lot of coffee than it is always better to have one with a big water reservoir. As we can see, these Nespresso machines are very similar to each other, there are only a few differences which are not that big. You can probably make a decision by its price since that is the only big difference between them. We hope we cleared up the mist around Evoluo and Evoluo Deluxe.